The Olympics made me do it. The Olympics and Blandina. You see, Blandina gave me a beauty of a charm square pack she’d had in her stash for many years (she bought it when she was three ;). 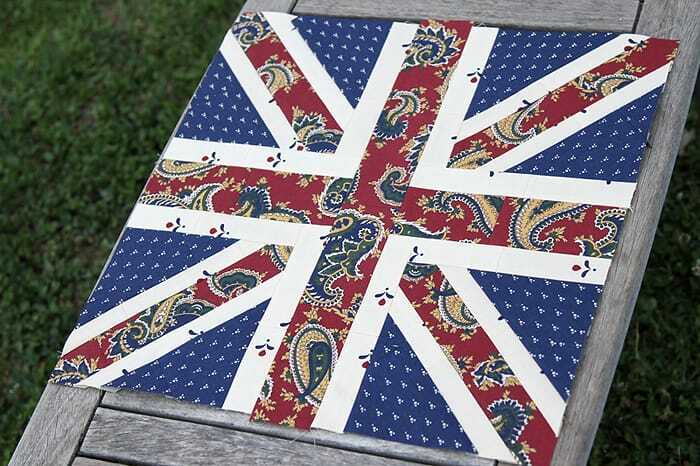 I wasn’t sure what I wanted to make with it until I saw those Union Jacks all over London. I had a 40 cm/16 inch cushion form that needed a new cover. Remember, when you print it out to set your printer so that it’s NOT to scale – it should be printing at 100% (some printers’ default setting is to print at 97% – this is not what you want). Then it was time for the St. George cross. This is where you might like to alter my design. As you might have noticed from my top photo, I like my cushions well-stuffed, and I don’t care who knows it. 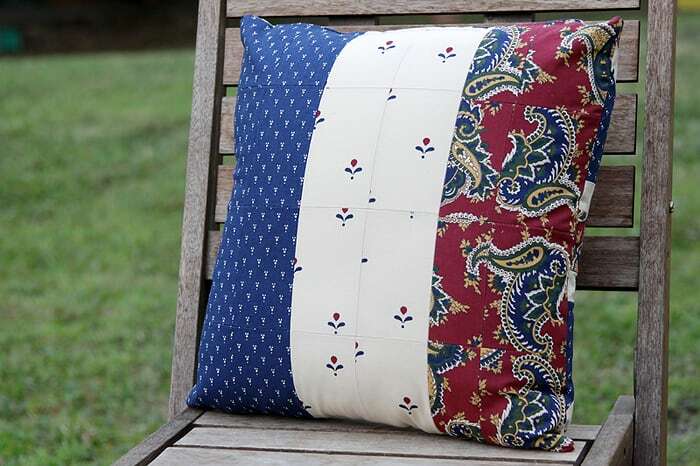 If you like your cushion covers a little looser, or you plan on quilting the cover, you might like a little more ease in there. If you like it toight like a toiger, use 2.5 inch red strips. If you’d like more ease, go for 3.5 inch strips. Yay for Jack. You can easily turn it into a cushion now using this tutorial. I spent a little time considering the back of my cushion. Being Australian I like to see the Southern Cross wherever I see a Union Jack but to be honest, I couldn’t bring myself to make all those itty bitty stars. So I took the easy route and made the French flag instead. Can Jack and Marianne live together? There you have it, a little bit of the 2012 London Olympics for your couch. This is a fantastic tutorial Kirsty, I just love your cushion. Thanks for sharing. You seem to do it all, don’t you! Love it! I have seen a few of these around in the shops and now I can make my own! Love your fabrics that you used. Beautiful, just beautiful! 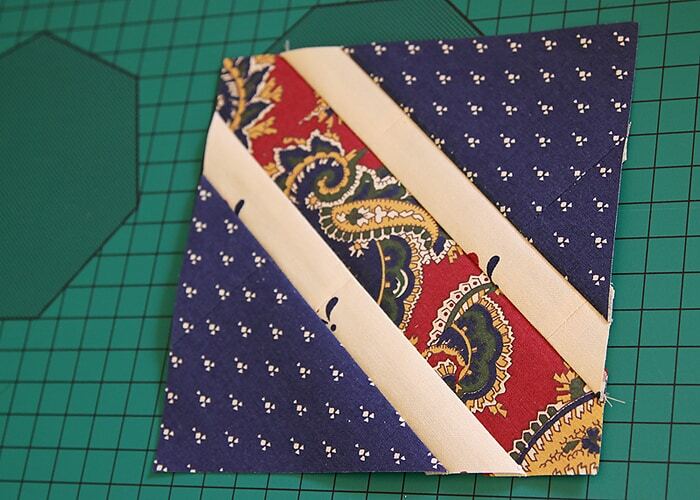 The perfect use for this fabric! Thank you…I want to try one of these soon! 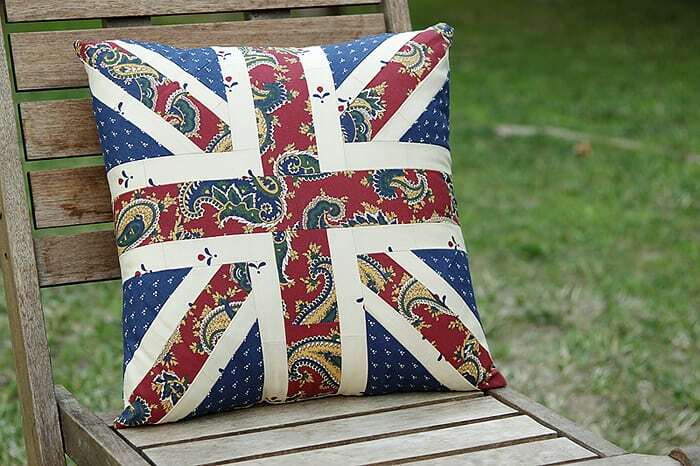 I know, I know, but if I called it a Union Flag pillow everyone would think of the American Civil War! Well, at least that’s what comes to mind for me. I hope all you good people of the UK will forgive me. I really love your flag! Great tutorial and beautiful cushions. Awesome! Loved reading this post! Wow, this was a surprise! 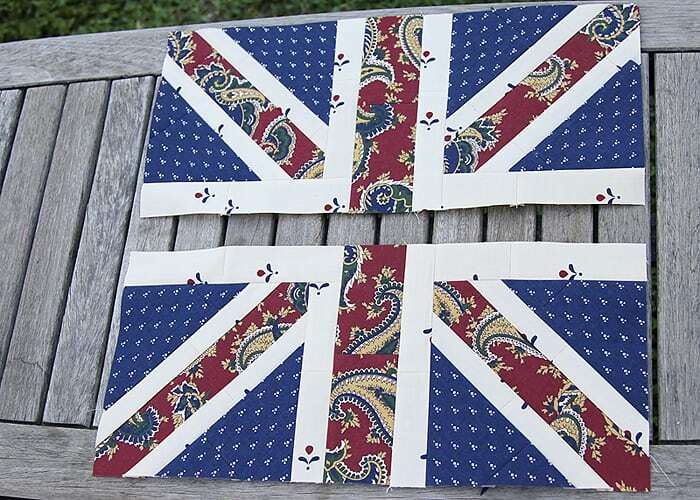 And the fabric looks much prettier transformed in the Union Jack. I am glad that you could find such a great use of the old charm pack. Wow just found your site and I so loved your cushion that I had to lcomment! Thanks Jill! 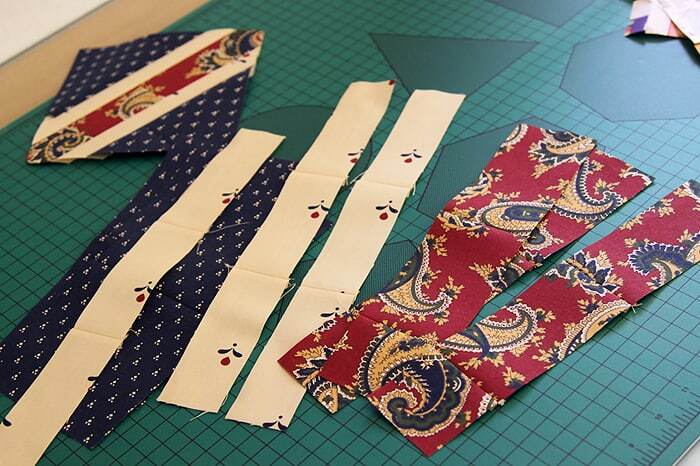 Happy sewing and see you again soon! Thanks for the great tutorial! I made my version of your cushion as a gift to a friend, and she loved it! Thank you! Thank you so much for this tutorial, I have made 3 different cushions in different colourways and they all look fantastic. Guess what everyone is getting for Christmas !! 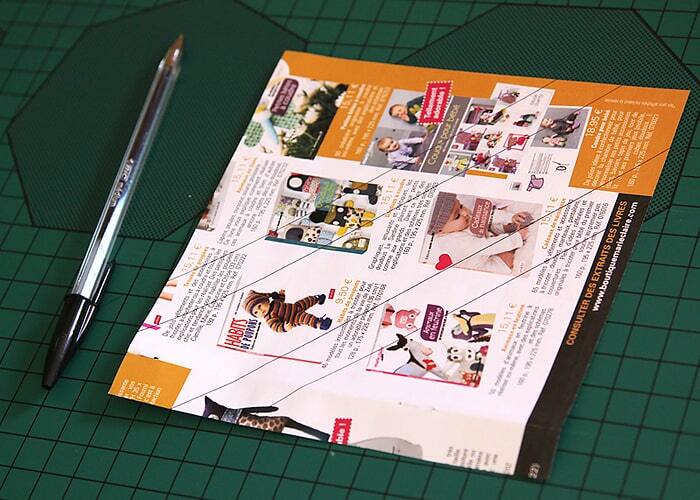 Hi, really keen to make this but was wondering what seam allowance was used and if it was included in these measurements or added on extra? Just discovered your blog and LOVE IT!! 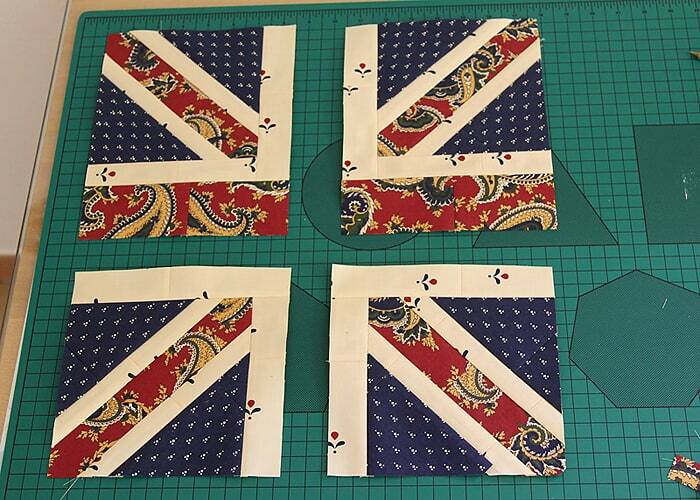 This Union Jack cushion is awesome and I plan on making one for a pressie to give to my friend in ENgland. I tried to get the free pattern by entering my e-mail, but no luck as of yet. 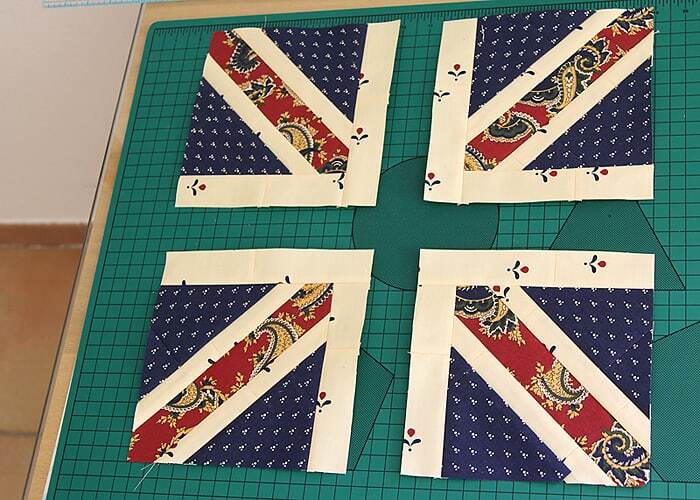 Please let me know how to get this free PDF for the union Jack. 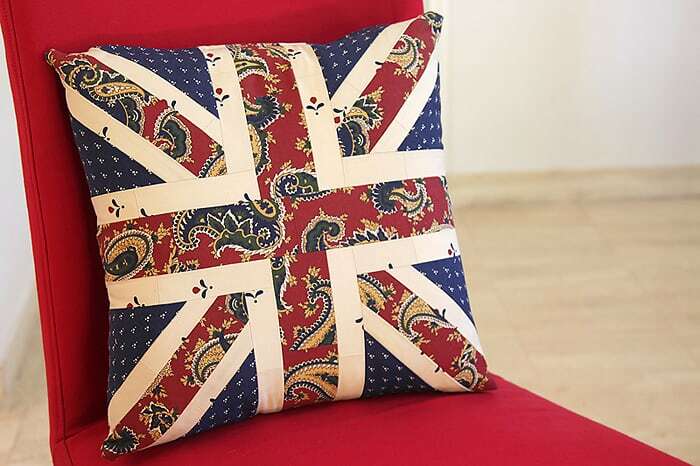 I love this beautiful Union Jack cushion. The fabrics you used give it a really luxurious look. 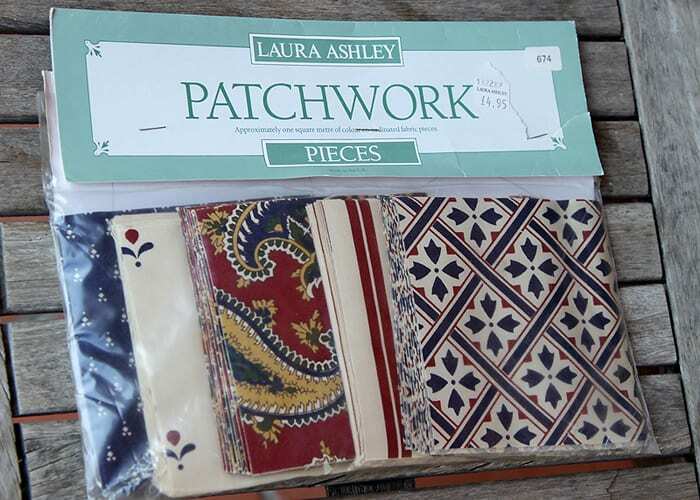 I am new to patchwork, but I simply must give it a go. Thanks so much for your tutorial . I can’t wait to give it a go! Go for it, June, I’m sure it will look fabulous!